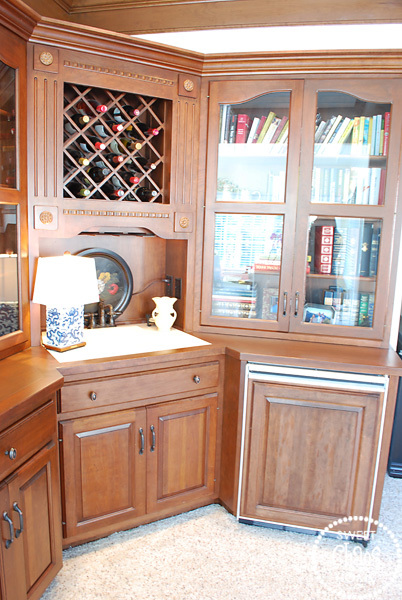 Sweet Chaos Home: Wet Bar Turned Work Station? You know how every time I decide to make a small change to my house it snowballs into a larger, more time-consuming project? Yes, well, that's about to happen again. 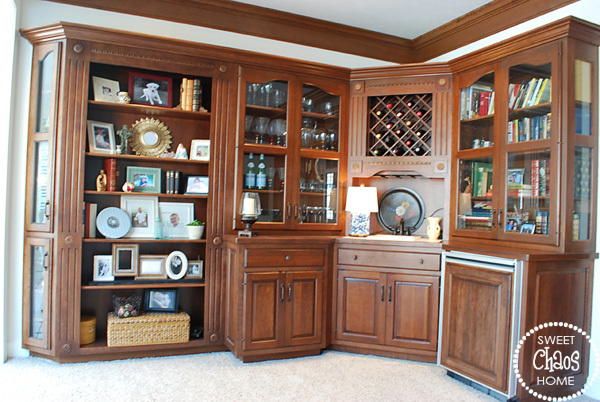 Twenty years ago, I'm sure these built-ins with wet bar were all the rage. I mean, nothing said "you've arrived" like the ability to serve cocktails in the family room, right? Well, as much as the idea of having a martini at arm's length seems very Mad Men-esque, it just isn't my reality. We do use the small refrigerator for sodas and beer, and we do store our wine and wine glasses (and books and random tchotchkes ) here. Frankly, I've never particularly cared for the dark, heavy look of these built-ins and would be fine for them to go away. My husband, on the other hand, is oddly attached to his beer fridge and wine rack. (Even though we have a bar in the basement, too). Men! So, after living with the built-ins for 6 years, my simple solution was to have the whole thing painted to make it more aesthetically pleasing. I thought that was a simple solution. Until I met with the painter. And got the quote. To have the unit painted to have a "factory finish" was going to cost a small fortune, and to put money into something that I could live without seemed crazy. Now, perhaps the most logical solution is to just tear out the whole thing. But that would leave us with a lot of unused space. Hmmmm... what to do? I pondered aloud to my husband, who said "Just leave it. I like it." Men! I pondered aloud to my mother (the voice of reason) who said, "Why not use that space as a homework station." And, with those words, the heavens opened up, the angels sang, and Google Images reported an inexplicable increase in keyword searches for "homework station" and "home office." Somewhere Don Draper is appalled. 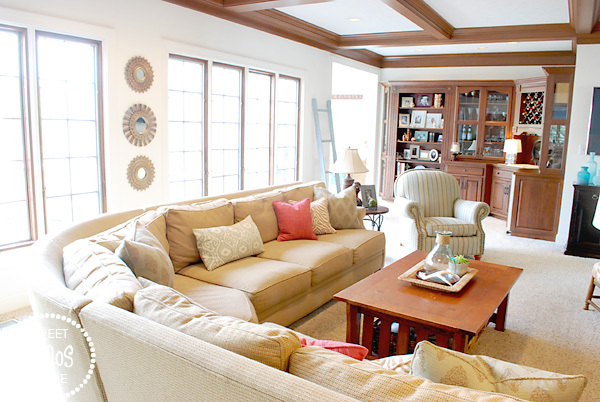 Have you changed anything in your house that just wasn't functional or practical for your lifestyle? Any regrets? I think you are going to have a wonderful homework station...what are you studying, if I'm not being too nosy?